Want to start an e-commerce marketplace? If you’ve done your homework, you’ll know that your single biggest challenge (or “barrier to entry” in MBA-speak) is what they call the chicken-or-the-egg problem. You see, the problem is that you won’t be able to pull in the sellers without buyers, and obviously the opposite is also true. And as any seasoned Internet entrepreneur would tell you, traffic (or distribution) is the lifeblood of an online business, and the lack of activity is the death kneel of any platform which relies on two-sided (producer and consumer) participation. In other words, a platform has zero value unless users use it. 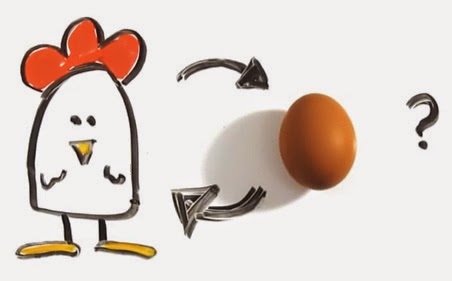 The chicken-or-the-egg problem is insanely difficult to solve, but that’s also what makes (successful) marketplaces valuable. In the spirit of full disclosure: I’m not in the e-commerce space. I am the founder of GoodPlace.my, a property deal matching platform which I started in 2013. Starting from zero, our platform is currently used by some 50,000 home buyers and agents monthly. We have launched our business using the exact framework that I am sharing with you in this article, and you can use the same method if you’re building a marketplace which hinges on two-sided participation: e-commerce sites, online classifieds, daily deals. 1. Engineer’s bias. A good portion of founders are engineers, and they would naturally drift to what they do best: code. 2. Funding requirements. To get seed money, a product prototype is a must-have “show and tell” tool. Traction (seems to be) optional, which is a shame. 3. Tangibility. A completed product is a tangible, celebratory milestone. Now once the platform is built, then the next natural course of action would be to build up the user base on the supply side. The tendency to focus on the supply (rather than demand) is perhaps understandable because no shopper would want to go to a shop with limited products. 1. Get an army of salesmen to cold call and knock on doors. Throw enough bodies at the problem until sufficient scale is reached. 2. Scrape listings from existing marketplaces (i.e. your competitors). 3. Spam, spam and more spam – email, search engines, social media, mobile. 1. You have limited time before your sellers (typically the people who are going to be your customers eventually) lose interest and realize that you’ve got no buyers. 2. You often have to resort to offering “free packages” to entice signup, and you’ll be hard pressed to monetize an audience of freeloaders in the future. 3. “Brute forcing” your way to sign up customers require heavy resources which would shorten your runway, possibly significantly. Now let’s investigate the idea of focusing on buyer traction first – i.e. 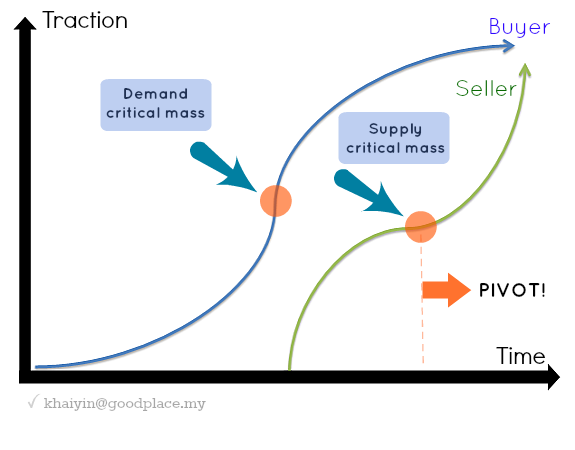 driving demand before developing the product and getting supply. This approach can be counter-intuitive; indeed, how can one expect to drive demand without the platform and product already in place? 1. Google built up considerable consumer (i.e. searcher) traction first before monetization through paid keyword-specific link placements (Adwords). Note that the Adwords supplementary to the search engine; the latter remains Google’s primary platform. 2. Instagram started as a single user utility (i.e. a photo taking and digital filtering app) before enabling its social networking platform by leeching traffic off Facebook and Twitter. 3. Delicious was an online storage of bookmarks before achieving the critical user traction which then enables the bookmark sharing platform to take off. Next, let’s investigate how we can apply this model in an e-commerce startup by going into a “standalone mode” first to build buyer traction. 1. Geography: e.g. Klang Valley, Penang, East Malaysia. 2. Vertical: e.g. Home improvement, DIY recording, vegan cooking. 3. Niche Community: e.g Pregnant moms, amateur photographers, performance car enthusiasts. Amazon was first founded as an online book seller (i.e. it tackled a relatively small piece of the entire e-commerce category during that time) before expanding rapidly into other areas of e-commerce – consumer electronics, fashion, music, cosmetics, groceries. Before I started GoodPlace.my, I piloted the standalone mode approach by addressing a smaller segment of the Malaysia property market. Via the KLCC Condominiums Database, I started a review resource on Kuala Lumpur City Centre (KLCC) properties which contained comprehensive analysis of every condominium in the KLCC enclave. Our review blog has since managed to outrank most other established property portals on Google, and with the organic user traction of some 10,000 unique visitors a month (valued at about RM25,000 to 30,000 in Adwords spend), we were able to quickly pivot to the deal matching feature which has since morphed into GoodPlace.my’s DealMatcher platform. In order to solve the chicken-or-the-egg conundrum, focus on driving up demand levels first via “standalone mode”. With sufficient buyer traction (and a long enough runway! ), you will be able to roll out your platform and iterate your way to success. • STEP 1: Build buyer traction via the “standalone mode”. Get to critical mass. • STEP 2: Get seller traction, capitalizing on buyer traction that you have built in Step #1 above. • STEP 3: Pivot from the “standalone mode” to the marketplace. This article is written by Khai Yin, founder of GoodPlace.my, a Malaysia property blog and deal matching platform. He can be contacted at khaiyin.com.